Volkswagen's first compact SUV, the Tiguan takes on the popular Honda CR-V and Toyota RAV4 that have dominated the market. 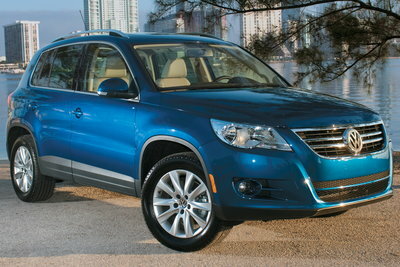 The base Tiguan S and SE are priced competitively below $30K, while the Tiguan SEL tops out at over $37K. Cloth upholstery is standard on Tiguan S and SE models, but the SEL has standard leather seats. The base Tiguan S is front-wheel drive only, while the 4Motion all-wheel drive system is optional on the SE and SEL models. A standard 200-bhp 2.0L turbo-4 is coupled to a choice of a 6-speed manual (Tiguan S only) or automatic. On upper trim levels, the Tiguan includes 17 or 18-inch alloy wheels, while the Tiguan S gets 16-inch alloys. Options include a panoramic sunroof, DVD/hard disk-based navigation system with rearview camera, trailer hitch, and rear side airbags. ABS and ESP (Electronic Stability Program) are standard on all models. The Tiguan is rated to tow trailers up to 2,200 lbs.